“Steel You Can Count On” that meets various needs of customers. Special steel is used to make critical parts of automobiles, industrial machines, plants, etc. Needs for special steel are becoming more diversified and stringent, responding to the needs for better performance and function, less environmental impact and greater cost competitiveness. Sanyo Special Steel has been supplying high-quality special steel featuring the maximum performance to society, incorporating the high-cleanliness steel manufacturing technology that has been established over many years. 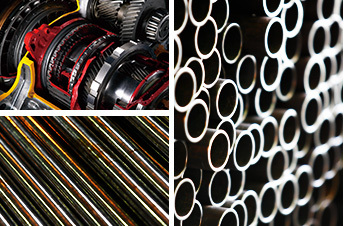 We are determined to offer “Steel You Can Count On” that meets the needs of customers in all aspects, including quality of special steel and stable supply. They are value-added products made by processing raw materials into shapes similar to final products. They are advanced materials that contribute to products with improved performances. The information provided on this website covers the major items that we can produce, but there may be cases where we cannot respond to orders for some particular reasons. The information included in this website consists of reference values that explain the typical properties and performance of products, and other than those stipulated as standards, these values are not guaranteed. Please be aware that we shall assume no responsibility for damage arising from the mistaken or inappropriate use, etc., of the information included in this website. The information included in this website is subject to change without notice. Please contact the department in charge with regard to the latest information.